When are we going to catch a break? Apparently not for a while. Winter storm Harper plowed through the Midwest and Northeast last weekend. The snowstorm took 10 lives and canceled thousands of flights. Not to mention knocking out electrical power to tens of thousands of homes and businesses. And causing countless crashes on roads. Harper dumped one to two feet of snow in some places. As of Monday, many travelers were still stranded in airports. And flights were still being cancelled. Among those who perished during and following the storm were a New York man who had a heart attack. And a 12-year-old Illinois girl when a snow fort collapsed on her. A utility worker in Connecticut passed away after a tree fell on him. A Kansas Department of Transportation worker was killed. His death occurred in a rollover crash during a snow removal operation. Airports were crowded with stranded passengers. They couldn’t get a flight home… or anywhere, for that matter. Two airplanes slid off runways after landing. One at O’Hare Airport in Chicago, Illinois and another at Eppley Airfield in Omaha, Nebraska. As if the snow wasn’t enough, cold temperatures followed. They made life miserable for those out in the elements. In Pittsburgh, all train service into and out of the city was stopped. That happened after overhead power lines were frozen. Ice caused the closings of many roads. And reduced speed limits on New York, Massachusetts and Pennsylvania interstate highways. There were problems in Ohio, Indiana and Minnesota, too. Big rigs slid off roads. And tractor-trailers jack-knifed, blocking lanes for hours. Following in Harper’s snow prints was winter storm Indra. It’s currently predicted to go across the northern tier of the U.S. from Tuesday through Thursday. Although not quite as strong as Harper, Indra is bringing plenty of snow and freezing rain. Especially to areas that had already been hit hard by Harper. And, of course, this storm is creating plenty of travel headaches. The Colorado Department of Transportation shut down a stretch of Interstate 70 east of Denver. In Wyoming, Interstate 80 was closed. And now, what are millions of Americans facing? Bone-chilling temperatures. This weekend, highs were expected to remain in the single digits or low teens in some states. Including Illinois, Wisconsin, Michigan and others. Long-range forecasts for much of the northern portion of the country don’t look good. They call for colder-than-average temperatures. At least through mid-February, and maybe longer. There were undoubtedly a number of survival stories that came out of these latest winter storms. But the one that hit closest to home for us at 4Patriots occurred on a highway in Marion, Illinois. Two of our customer service representatives were returning home last weekend. That was following our quarterly meeting in Nashville. A blizzard created a 6½-hour shutdown of the interstate on Saturday and leading into Sunday. Nobody was moving. Everyone was stuck. Aerica P. and Corrie C. from 4Patriots were together in a car. Since it was obvious vehicles were going to be at a standstill for a while, they decided to start up a community with those around them. 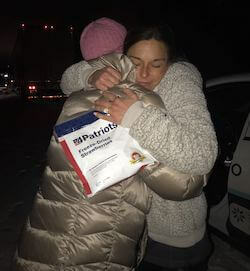 The ladies helped some drivers around them by giving them 4Patriots survival food. They also gave away snacks and water bottles. Then they noticed one young woman alone in her car. She was crying. They learned she was from St. Louis, Missouri, and was recently married. She was very fearful about her situation. Aerica and Corrie did more than give water and snacks to her. They also provided privacy when the woman needed to use a makeshift restroom (a bucket) between two open car doors. “We just started helping people,” Aerica said. “We told the truckers and state troopers we had survival food, water, snacks, clothes, gloves. Even a bathroom for the ladies if anyone needed help. “Folks were really scared they were going to run out of gas and it was like 10 degrees. Blizzard conditions and wind gusts were awful. It’s one thing to help someone on the phone by describing survival items and answering questions. Our customer service reps do that seven days a week and do a great job of it. It’s quite another to reach out and physically help a person in need during a frightening crisis. Obviously other drivers in their vicinity were even more blessed. The kindness of strangers who turned into friends was just what they needed to weather the storm.